For the past couple of weeks Spud's class has been involved in presenting science experiments. Each student has been given a unique experiment on which to practice: Spud's topic was on acids and alkalis. We had a ton of fun preparing for the experiment leading up to the big day. 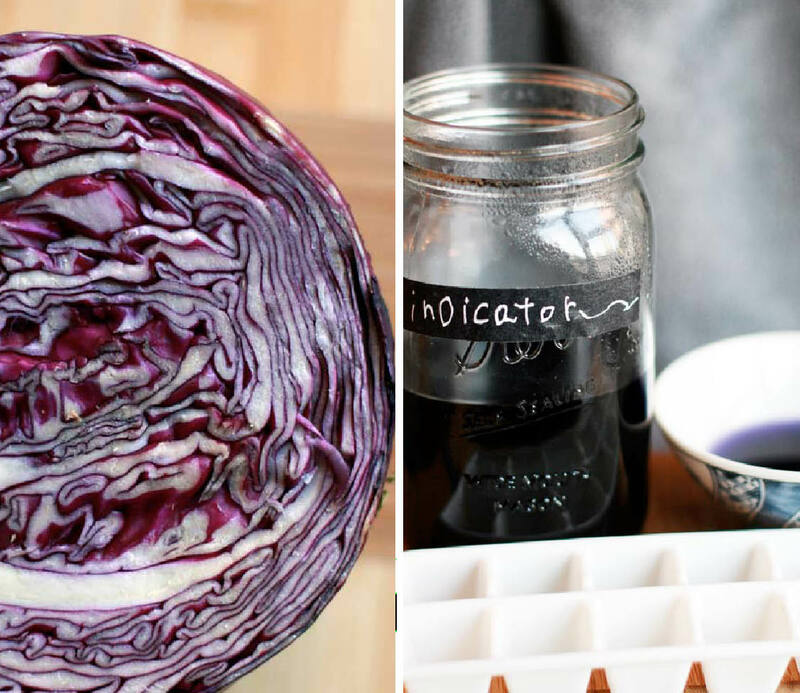 First Hubs and Spud made an "indicator" out of chopped red cabbage. They boiled the cabbage in water and then ran it through a strainer. The colour turns out simply stunning and makes up for its rather smelly nature. Next, they froze the indicator in an ice cube tray. So what makes this an "indicator"? Well, it changes colour when added to other liquids. The colour it changes to depends on the acidity of the liquid you put it in. So the next step is to prepare 3 liquids: one with lemon juice and water (acid), one with just water (neutral) and one with baking soda and water (alkali). And look at the pretty colours! You know it's a neutral when you add the indicator cubes and the liquid remains purple. 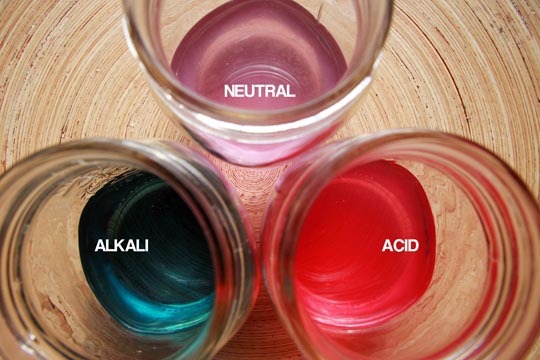 It turns pink when you add it to an acid. And it turns blue when you add it to an alkali. I sat in on the presentation and saw a couple of the others too. As you can imagine, it was all seriously cute. At the end of each presentation Spud's teacher asks the class to offer up "2 stars and wish". In the creative world, this is called a "feedback sandwich" (shout out to Sparks!). It essentially means you find two good things to say about the presentation and one bit of constructive criticism. So can you guess what the one wish was? Consistently for each presenter? "I wish that your experiment had blown up". How awesome is that? Gotta love the 7 year old set. Leading up to presenting day, Spud didn't seem nervous at all (which made me wonder if there was a baby switch at the hospital or something). But the day before his presentation, he started to complain of nervousness. I felt so bad for him. I can truly empathize. But I desperately didn't want to put my issues on him. The only thing I could think to do was give him some strategies for coping. Number 1 was "practice". "The better you know your stuff the easier it will be", I told him. Number 2: "get a big hug from a loved one". I told him that hugs actually physically squeeze out nervousness. Before dinner we had some time for cuddling on the couch, including some nervousness-squeezing. A couple of minutes later I saw he was writing a note, but I didn't think too much about it, until after dinner when I saw the note placed on his experiment gear waiting at the front door for tomorrow morning. It said "Don't forget you had a hug". I am with him, I hated class presentations and getting up on stage. I was amazed at Ebi-kun getting up and performing to the whole kindy and the parents with not even a bat of the eye lids! Jo, I love that Ebi-kun feels at ease with presenting. This will serve him well in the long run. Ms. Scott, thank you so much for your note! I almost can't believe THE Ms. Scott left a comment ... star struck a little bit ... hee. I thought it went well, poor guy was pretty hard on himself "did I make any mistakes?" he asked me afterwards. I said, "it's not about not making mistakes, it's simply about sharing what you learned with the class". All the presentations I saw were great ... those little guys are really growing up! And Ms. Causey is amazing at getting the most out of them. This is the sweetest story. I have a 7 year old too and we have been discussing the same sorts of fears while we prepped for a class project he is doing today. I will tell him that bit about the hug. Aw. Good luck to your little guy CAlili. Give him a squeeze! Oh how sweet. I have had a rough week with my toddler and you have reminded me the joy oh having a kid. Thanks so much for your post. sonya, thank you for your sweet note. your blog is adorable btw!